Ebimeshi which could be translated to “shrimp-rice” is a specialty of Okayama Prefecture and I had my first ebimeshi experience at Indeira in Okayama City. Curry might be the last thing you associate with Japan, but it’s has been a national favorite since it was first introduced by the British navy during the Meiji era and was adopted by the Japanese to a point where it is considered a national food. Japanese curry is an historical and geo political culinary dream come true and Tokyu Curry in Hiroshima which was suggested by a friend who knows his curry and it’s a great place to try Japanese curry. Some people do crack-cocaine, I do Ippudo ramen. I was hooked the first time I tried it in Fukuoka and I am always craving it. Hakata ramen is my favorite style of ramen so far and I found out that Ippudo tsukemen is the perfect summer meal. About a week ago, my boss asked me if I wanted a bibimbap for lunch. I spent the whole week wondering how a burning bowl of bibimbap could be delivered to my desk, well I got my answer today. 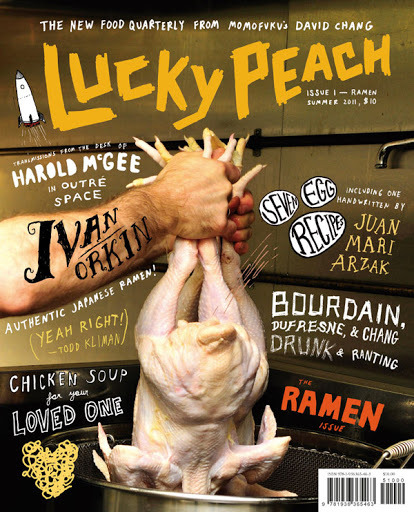 When I heard that David Chang, the mastermind of Momofuku restaurant, created a magazine about ramen, I ordered it right away and awaited my copy of Lucky Peach like a kid waiting for Santa Claus. Sadly the shop is CLOSED (I think 2017), the building was destroyed and nothing is left of this amazing ramen shop. We found a ramen shop named 止 by the side of the road just outside of Niimi in Okayama Prefecture. This single kanji means “stop” in Japanese and reads Tomare, a very short name for a great ramen place and one kanji every one should learn since it’s featured on every stop signs in the country. Kuishinbo: Offal Gluttony in Tsuyama. I don’t know why, but Tsuyama in Northern Okayama Prefecture is the capital of horumon fried udon. It’s quite common for Japanese cities to build their reputation on a particular specialty, but it takes some gusto to build this fame cooking offals or as some might call it the “discarded bits”. Author adminPosted on July 5, 2011 Categories B-1 Gourmet, Fast food, Japan, OkayamaTags food, horumon, Japan, Japanese food, offal, offals, Okayama, Okayama prefecture, okonomiyaki, Tsuyama, udonLeave a comment on Kuishinbo: Offal Gluttony in Tsuyama.